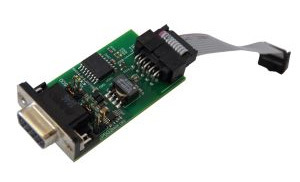 The PROFIBUS/RS485 Expansion Kit is compatible with Critical Link’s line of MitySOM based development kits; one is required to interface with this expansion kit. Specific MitySOM based System on Modules support PROFIBUS. All MitySOM based System on Modules support RS485, see the tables below for details concerning SM and Development Kit support for PROFIBUS. The PROFIBUS/RS-485 Expansion Kit provides standard serial interface at data rates up to 115,200 baud. The serial interface is routed to the UART2 serial port of MitySOM / MityDSP through the Expansion Header on a MitySOM based Development Kit. The galvanic isolation is provided by a dedicated TI ISO1176 transceiver. The ISO1176 is powered by an isolated power supply with 1000V isolation from the primary supply. There is also a 220ohm bus termination resistor that can be selected by placing jumper JP500.